Everyday routines whether at work or at home can lead to tension, especially when you are constantly on the move. Relaxation techniques come in all different forms, but few are portable to meet today’s fast-paced culture. Relief has finally arrived in this travel-sized coloring book filled with meditative illustrations to color at home or in-transit. Creative Mindfulness: Peaceful Designs provides inspiring artwork to help you de-stress and lead you to inner peace. Twenty-four black-and-white illustrations, perforated so that each can be removed to share or display, await your ingenuity. The designs have been created specifically to bring you to a serene setting with a variety of florals, feathers, and paisleys. Each page is on a sturdy art stock, perfect for any coloring medium you want to apply. 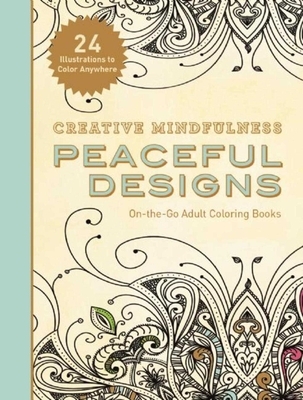 Whether markers, crayons, colored pencils, or pens are your preference, Creative Mindfulness: Peaceful Designs will help you relax and rejuvenate. This pocket-sized book is a must-have guaranteed to bring hours of artistic fun regardless of whether you are an artist looking to improve your craft, need a creative getaway, or want to give someone the gift of coloring. If you feel serenity slipping away and want to unwind, this book is a must-have, guaranteed to provide hours of creative relaxation. Get comfortable, and start coloring your vision for these unique designs! At Racehorse Publishing, an imprint of Skyhorse Publishing, Inc., we recognize the need at times to simply Be. Our broad range of books offer readers an escape from the daily grind to the virtual worlds of the many stories our authors tell. But how about escaping even more deeply? That's where Adult Coloring Books come in, and here is where we are dedicating ourselves to bringing you a variety of coloring books with which you can relax and lose yourselves into a meditation of creative self-expression. We invite you to check out our assorted series of Adult Coloring Books, and know that you'll find exactly what you need to bliss out.